In need of a heating service in Queens, New York? Don't just hire any heating company. Choosing cheap, poorly-trained heating techs could leave you needing costly repeat work. At Ranshaw, we take pride in separating ourselves from other heating companies in the area. Choose us and we'll save you money and frustration by delivering quality heating repairs and heating system installations—every time. Whether you have a gas boiler that’s giving you trouble, or a hot air furnace that suddenly stops working, Ranshaw can help. Our thoroughly trained technicians can repair your heating system regardless of make, model or age of your equipment. In fact, all of our trucks are fully stocked with parts, so you can expect your heating problem fixed on the same visit. Upfront pricing, meaning you'll know the price before any repair work begins. Is your furnace on the fritz? Or your boiler breaking down? Heating systems don't last forever. And as they age, they cost more to operate. We offer fast, quality heating installations in Queens that will save you money on heating bills and keep you warm and comfortable for years to come. Upfront price quote before work begins, so there are no surprises. 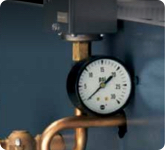 Not sure if your gas heating system really needs annual maintenance? Here's the ugly truth: not scheduling annual maintenance voids the manufacturer warranty on most heating systems and raises your heating bills. We offer comprehensive, 14-point annual maintenance that keeps your warranty valid and ensures lower heating bills all winter long. Our gas heating service plans are designed to give Queens homeowners complete peace of mind. Our gas heating plans prevent gas furnace/boiler breakdowns but also give you discounts should a repair ever arise. Problem: Queens resident, Robert T., found himself in a tough spot one winter night when his gas boiler suddenly failed, leaving him without heat. After a preliminary system check of his own, Robert called Ranshaw in search of a fast and reliable boiler repair. Solution: We sent one of our skilled boiler technicians, Bill B., out right away. He carefully troubleshooted the old gas boiler unit and determined the exact cause of the problem. In less than an hour, Bill had the boiler working again. Thanks to our team's fast service, Robert's family had their heat restored in a single visit.